This post describes the sixth day of my journey between Philadelphia and my home in Orem, Utah. I had been in Philadalphia for three months conducting a research fellowship at the Chemical Heritage Foundation (CHF) under a generous grant from the American Section of the Société de Chimie Industrielle, and my project was to research and collect media for The Elements Unearthed project, which I’ll be turning into a series of video podcasts and other educational materials. So on my way home, I’ve been visiting and videotaping as many related sites as possible. If you’ve been following along, I’ve been to the Drake Oil Well in Titusville, PA; interviewed Theo Gray in Champaign, IL on the periodic table; toured lead mines in Missouri; and visited the Kansas State Oil Museum in El Dorado, KS. Now I’m in Hutchinson, KS and the journey continues . . . .
On Saturday, September 5 I drove out of Hutchinson to visit the Kansas Underground Salt Mine. Just as there is a large body of oil and natural gas under Texas, Oklahoma, and Kansas there is also a huge layer of salt that covers these same states. At Hutchinson, the layer is 650 feet down and extends hundreds of feet further, with some layers more pure than others. 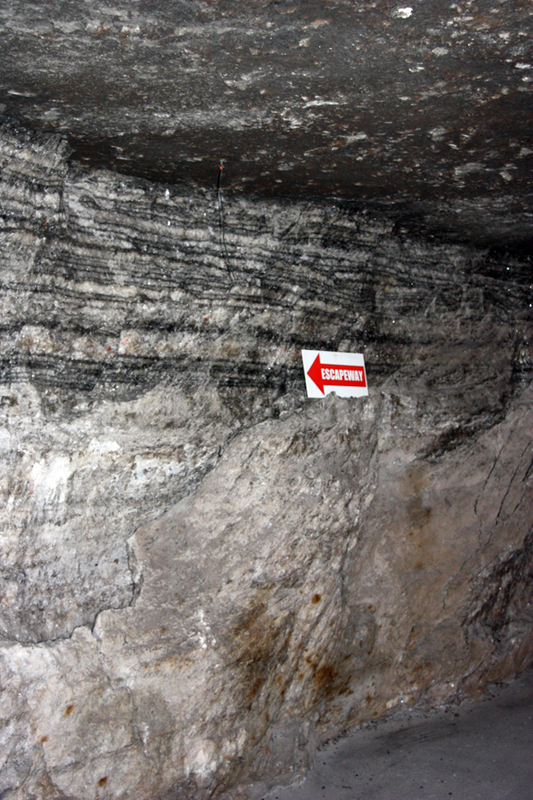 The layer the salt miners were after is over 96% pure and shown here as the whiter area at the bottom of the wall, starting under the distinctive dark stripe about 1/3 of the way down. They continue to mine salt here, spreading out in all directions. The old area of the mine is now used for a tour (they even have a gift shop down here) and as a storage facility for documents. Many movie and TV production companies send their original footage here, as well as props and costumes, to be archived. Although Kansas is fairly humid, any humidity that gets into the mine is absorbed by the salt, so that the temperature and humidity are constantly cool and dry: ideal conditions to archive celluloid footage and other types of documents. Some of the props and costumes are on display in a small museum off the gift shop. 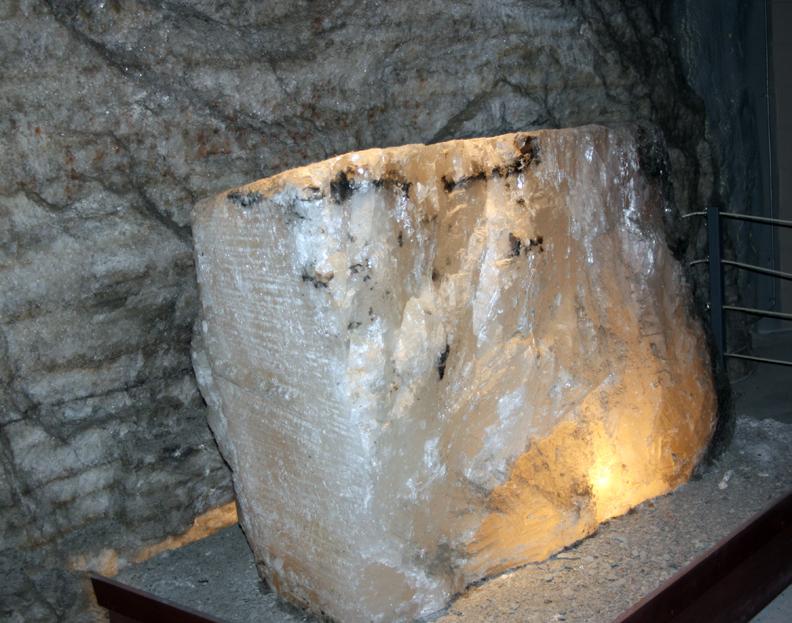 Although most salt mines today (such as the one near Moab, Utah) use a hot brine extraction method (pumping hot water into the salt deposit to dissolve the salt, then evaporating the brine in ponds on the surface), this mine still uses more traditional methods because of the purity and accessibility of the salt here. 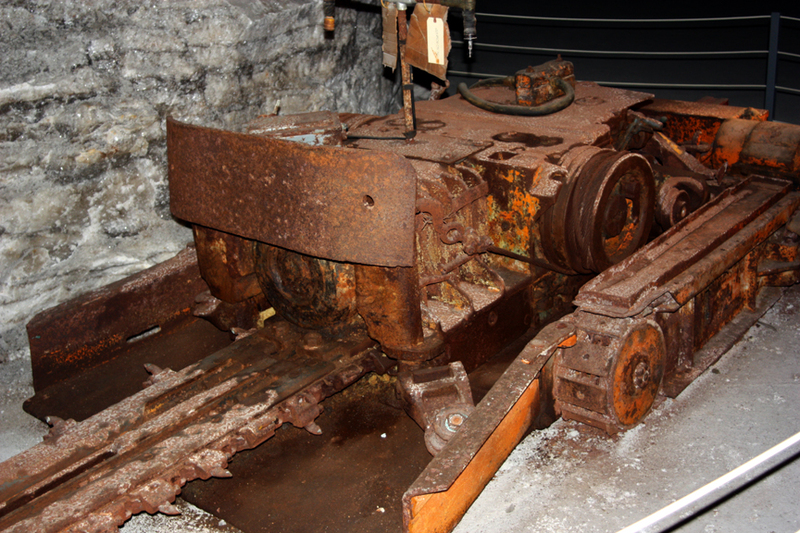 First, they use a machine like a large chainsaw to undercut the face, then drill holes using a hydraulic machine that can drill 4-8 holes at once, then they set charges and blow the face, then muck up the halite and transport it to the surface. The salt here isn’t used for human consumption; most of it goes for rock salt to de-ice the roads in Chicago. Some finds its way to livestock (similar to the halite mined near Salina and Redmond, Utah) and some becomes packaged as rock salt for making ice cream. After finishing at the Salt Mine, I drove west on US-50 toward Dodge City. 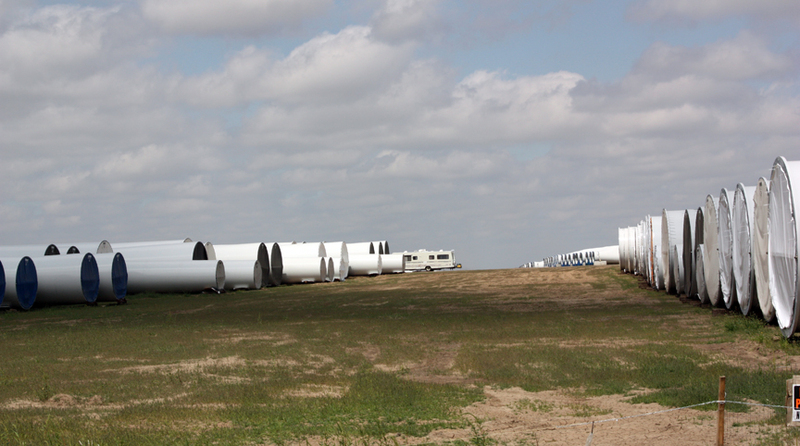 About 18 miles east of Dodge City I came across a large wind turbine farm, many already in operation and a large number getting ready for assembly. In the end, perhaps Kansas will create more energy out of its winds than out of its oil. After eating lunch, I got the heck out of Dodge and hit the trail toward Cimarron (yes, the puns are intentional), then crossed into Colorado. I was trying to beat the sun and make it to Cripple Creek before dark to take a few pictures. But since Colorado is on the eastern edge of the Mountain Time Zone, the sun set earlier than I am used to in western Utah and I made it to Mueller State Park west of Colorado Springs well after dark.